Rockingham Ranch and Gelfenstein Farm's multiple graded-stakes winning millionaire X Y Jet, Grade 1 winners Imperial Hint, Whitmore and Ransom the Moon and defending champion Chublicious are among 34 horses nominated to the $250,000 Xpressbet Frank J. De Francis Memorial Dash (G3) Saturday, Sept. 15 at Laurel Park. The 27th running of the six-furlong De Francis for sprinters 3 and up is one of seven stakes, six contested over Laurel's world-class turf course, worth $900,000 in purses on the Fall Festival of Racing program that drew a total of 245 nominations. Honoring the late owner of Laurel and legendary Pimlico Race Course, the De Francis' roster of past winners includes Hall of Famer Housebuster and fellow sprint champions Cherokee Run, Smoke Glacken, Thor's Echo and Benny the Bull. X Y Jet ran third as the favorite in the 2016 De Francis and went unraced for more than a year before reeling off four wins in his next five starts including the 2017 Mr. Prospector (G3) in his return and the Smile Sprint (G3) last out June 30, both at Gulfstream Park. Trained by Jorge Navarro, X Y Jet owns 10 wins, eight of them in 13 tries at six furlongs, and $1.55 million in purse earnings from 22 career starts. He has also finished second twice, beaten a neck and a head, respectively, in the 2016 and 2018 $2 million Dubai Golden Shaheen (G1). Raymond Mamone's Imperial Hint is 2-for-2 at Laurel Park, winning the Fire Plug Stakes and General George (G3) in 2017, going on to win the Smile Sprint and finish second by a length to eventual champion Roy H in the Breeders' Cup Sprint (G1). This year, the Luis Carvajal Jr. trainee has won back-to-back starts capped by the Alfred G. Vanderbilt (G1) July 28 at Saratoga. Robert LaPenta, Ron Moquett and Head of Plains Partners' Whitmore also became a Grade 1 winner at Saratoga this summer with a 1 ½-length triumph in the seven-furlong Forego Aug. 25. The multiple graded-stakes winner of nearly $2 million in career purses finished third as the favorite in last year's De Francis but was elevated to second following the disqualification of runner-up Blu Moon Ace. Agave Racing Stable and Jeffry Wilke's Ransom the Moon is coming off his second straight win in the six-furlong Bing Crosby (G1) July 28 at Del Mar, where he is based with trainer Phil D'Amato. 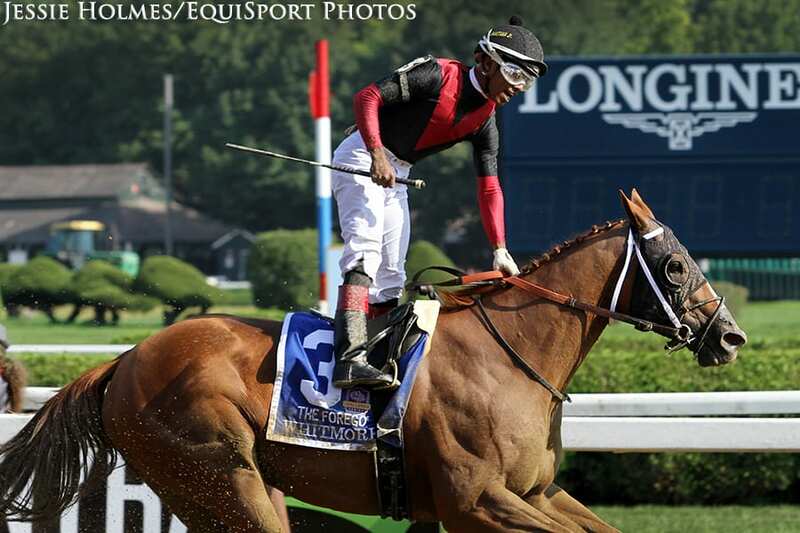 He last came east when he finished fifth in the one-mile Metropolitan Handicap (G1)June 9 at Belmont Park. Also nominated are Chublicious, 10-1 upset winner of last year's De Francis by a neck who has one win from three starts this year for New York-based trainer David Cannizzo; 2016 Maryland Sprint (G3) winner Always Sunshine, coming off back-to-back stakes victories, the latter at Saratoga; multiple Grade 2 winner Limousine Liberal; and 2018 Maryland Sprint (G3) winner Switzerland. The De Francis is the last of five races in the 3-year-old and up dirt sprint division of the revived Mid-Atlantic Thoroughbred Championship (MATCH) Series, an assortment of 25 races at tracks in Maryland, Delaware, New Jersey and Pennsylvania which kicked off May 18 and 19 at Pimlico. Division and overall points leader Laki, based at Laurel with trainer Damon Dilodovico, is nominated. Other MATCH Series finals on the Sept. 15 card are in the 3-year-old and up turf sprint division – the $100,000 Laurel Dash and the $100,000 Sensible Lady Turf Dash for fillies and mares, both at 5 ½ furlongs, races which attracted a total of 80 nominations. Each of the top two horses in standings points – stakes winners Oak Bluffs (22), based at Pimlico with trainer Mary Eppler, and Imprimis (20) – are nominated to the Laurel Dash along with stakes-placed Dubini, fourth with 12 points and multiple graded-stakes winners Disco Partner and Hogy. Multiple stakes winner and Maryland-bred champion Crabcakes, second in the Jameela Stakes Aug. 18 at Laurel in her turf debut, is among the Sensible Lady nominees, joined by defending champion Always Thinking, a 25-1 upset winner last fall; 2017 Sensible Lady second- and third-place finishers Fire Key and Rocky Policy; Grade 1-placed Lady Alexandra; Grade 3 winner Morticia; and Shimmering Aspen, a multiple stakes winner on dirt. The $150,000 All Along for fillies and mares 3 and up at 1 1/16 miles on turf drew 34 nominations including Stuart Janney III homebred My Impression, winner of the Commonwealth Oaks (G3) last fall in her lone trip to Laurel. My Impression is trained by Hall of Famer Shug McGaughey, who has won the past two editions of the All Along with On Leave in 2017 and Onus in 2016, when the race was called the Lady Baltimore. Stakes winners Chattel, Mooji Moo Jr. and Grade 3-placed Mr Chocolate Chip are prominent among 33 nominees to the $100,000 Laurel Futurity, while the $100,000 Selima for 2-year-old fillies saw 42 horses nominated led by Grade 3-placed Congrats Gal and Sorority Stakes winner Decorated Ace. Both races are run at six furlongs on the grass. Rounding out the stakes action is the $100,000 Laurel Turf Cup for 3-year-olds and up at 1 ½ miles which drew 22 nominations topped by Carrick, 38-1 upset winner of the Secretariat (G1) Aug. 11 at Arlington Park in his previous start. This entry was posted in NL List, Racing and tagged De Francis Dash, imperial hint, laurel park, Maryland racing, match series, whitmore, x y jet by Press Release. Bookmark the permalink.